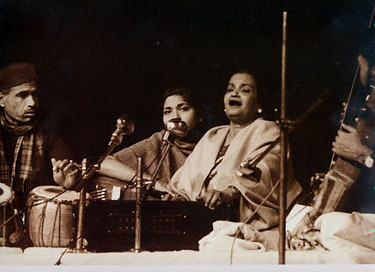 During Mallika e Ghazal Begum Akhtar last concert in Ahmedabad she raised the pitch of her voice as she felt that her singing had not been as good as she had wanted it to be and she felt unwell. The additional demand and stress that she put herself under resulted in her falling ill and was rushed to the hospital. She died on October 30, 1974 in the arms of Nilam Gamadia, her friend, who invited her to Ahmedabad, which has become her final performance. 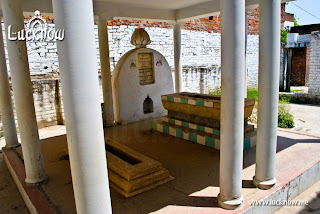 But Begham Akhtar’s Grave in Pasand Bagh , Thakur Gang, Lucknow lay uncared for and in utter neglect for decades, till her disciple, devotee and author of her biography, Padam shri Shanti Hiranand, took upon herself to restore it to its earlier glory. She relentlessly worked for this mission and her efforts are here for all of us to see. Sanatkada and Sadbhavna trust have assisted Shanti Hiranand restore the Mazar and it will be dedicated to the city of Lucknow . Her matchless, touching and emotive singing was an indivisible part of her chaotic life and by far the best part of it. 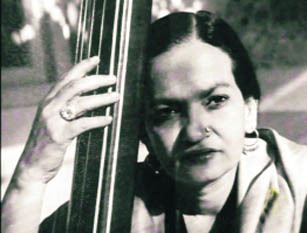 She was the most charismatic figure in 20th century Hindustani light classical music. 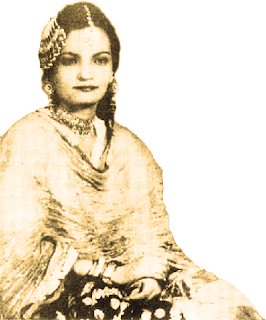 There were others before her and of her time, such as Durgesh Nandini Bai, Vidyadhari Bai, Badi Moti Bai, Rasoolan Bai, Batulan Bai and Siddeshwari Bai (later Devi, who was the author’s first guru) who were musically as gifted as, if not more than, Begum Akhtar but did not possess the kind of glamour that she had to reach out to listeners of all kinds, the initiat ed and the uninitiated. Begum Akhtar, or Akhtari Bai Faizabadi earlier, was in that sense unique both as a musician and a human being. At the tender age of fifteen she gave her first public performance. People were moved by her voice and she gained instant recognition. Her ghazals even impressed the famous poetess of India, Sarojini Naidu and was appreciated at a concert that was organized for helping victims of Bihar earthquake. Her first recording was done by the Megaphone Record Company and they released many gramophone records with her melodious Ghazals, thumris, dadras, etc. 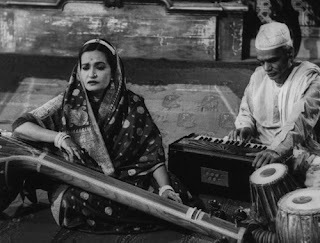 In 1930's, Begum Akhtar also acted in a few Hindi films which include Ameena (1934), Mumtaz Begum (1934), Jawaani Ka Nasha (1935), Naseeb Ka Chakkar (1935). In all these films, she sang all her songs herself. Begum Akhtar moved back to Lucknow after a while where the renowned director Mehboob Khan approached her for a film titled "Roti". The music was composed by the famous Anil Biswas. The movie was released in the year 1942 in which Begum Akhtar had sung six Ghazals. Unfortunately, four of the Ghazals were deleted due to some tension between the producer and the director. The film was appreciated by one and all and the music took the industry by storm. 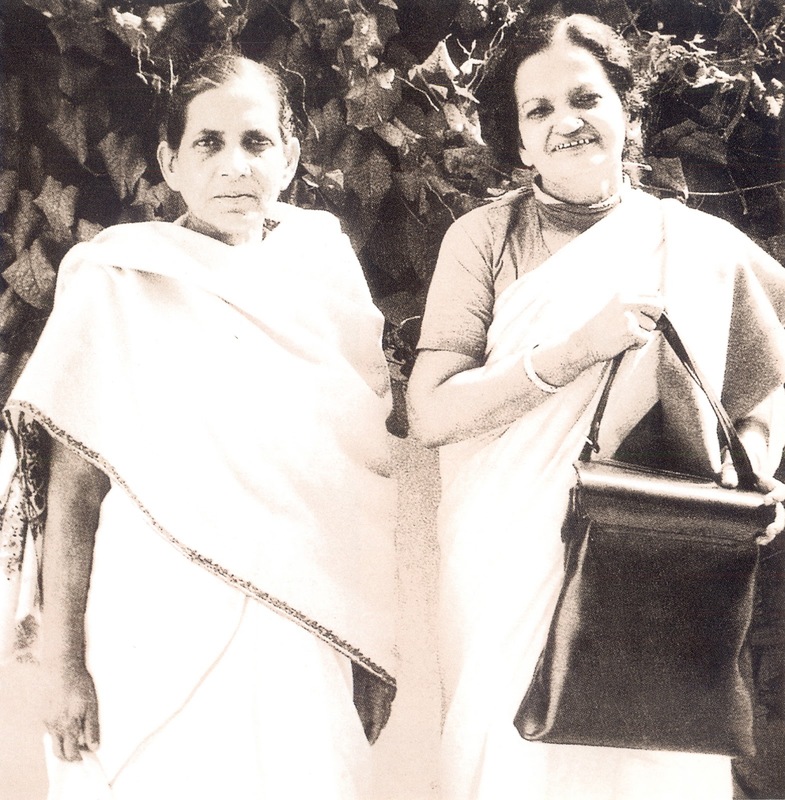 While Akhtari Bai’s fame soared as a singer on gramophone records and on the stage, her mother, Mushtari, had to create a “smokescreen” and declare that Shammo was her own daughter and Akhtari’s little sister. Seth Karnani, the financier of entertainments in Calcutta (now Kolkata) and owner of Corinthian Theatre, was clearly smitten with her but was shrewd enough to predict a bright future for the rising star. It must be remembered that the popular music of the day was raga-based, and Akhtari’s melodious, high-pitched, carrying voice was perfectly suited for the stage. She became a rage in Calcutta and her dadra, “Chaa Rahi Kali Hgata…”, was a huge hit as a 78 rpm gramophone record. Later, when her voice had deepened and she had married an elderly admirer, barrister Ishtiaq Ahmed Abbasi, Nawab of Kakori, she recorded the same song again. This time, the plaintiveness of her earlier rendering was replaced by an abiding poignance and the couplet Ae Masiha Ab toh bolo! Kya Tumhari Raae Haeye acquires a new meaning in the context of a life lived to the full in pain and in ecstasy. Begum Akhtar. Her matchless, touching and emotive singing was an indivisible part of her chaotic life and by far the best part of it. 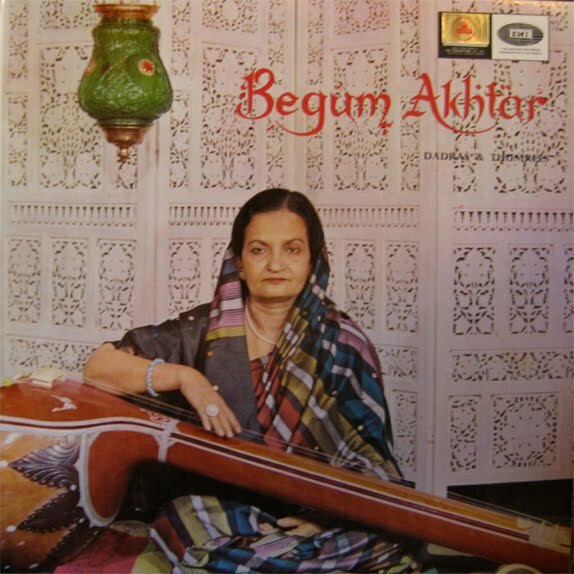 By charting Begum Akhtar’s journey through life and music, the author intentionally or otherwise creates a vivid portrait of a society as yet unable to shake off the shackles of feudalism while aspiring to modernity. 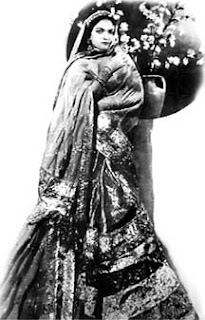 Akhtari came on the musical scene when the tawaif, or singing courtesan, was very much a part of the upper-class cultural scene in northern India. The landed gentry and the rising business class were both patrons of classical music and of the courtesans who specialised in light classical forms such as thumri, dadra, chaiti, baramasa and ghazal. Although dependent on words, each of these forms required of a singer to be well-trained in classical music. 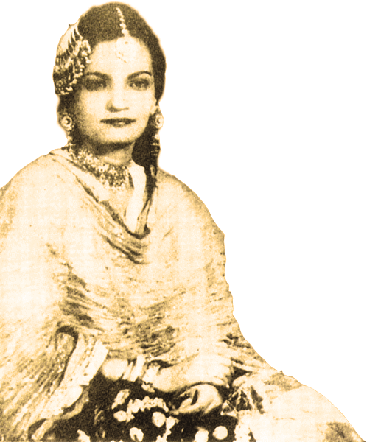 Old-timers such as Benazir Bai of Lucknow, pupil of the great Baba Nasir Khan, had also been instructed in dhrupad and dhamar in addition to khayal, tarana and the light classical forms. Young Akhtari, even when she was little Bibbi, was trained very well in the exacting art of khayal singing. 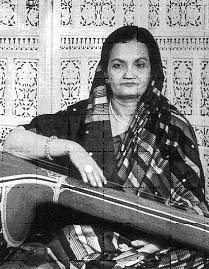 Her first teacher, Ustad Imdad Khan, made her sing kharaj (tonic of the lower octave) and gave her a thorough grounding in scales and the basic grammar of Hindustani music. She would wake up at 4 a.m. to practise. Her poor mother would stretch the family budget to the utmost to see that her gifted daughter got plenty of nutritious food. 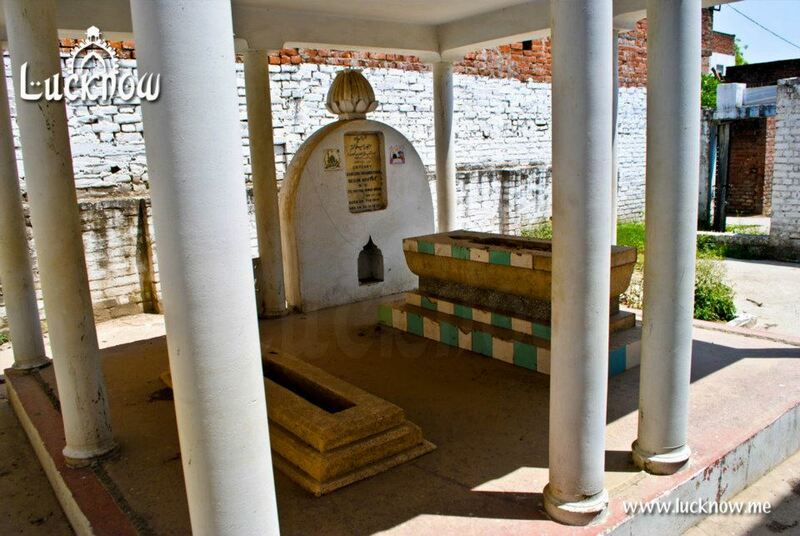 Ustad Ata Mohammed Khan of Patiala was her second guru. He came into Akhtari’s life thanks to sarodiya Ustad Sakhawat Hussain of the Shahjehanpur Gharana, who had just returned from his European tour as the music director of Madam Menaka’s dance troupe. 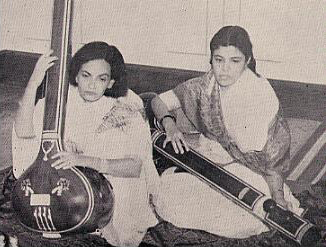 Ustad Ata Mohammed Khan started off Bibbi on a minor scale, Bhairavi. She took some time to get the hang of the komal swars (minor notes). The turning point came when Khan Saheb rendered, Gunkali, a mid-morning raga, “Ananda Aaj Moray Man Bhayo, Shubh Ghadi/ Shubh Din Muhurrat Sakhiyan Sab Mil Mangal Gaayen”. He made her practise for hours on the kharaj and do swar abhayas (voice culture) step by step, each note gliding from one swar to another in ascending and descending order and rendering each note with an enduring sa, re, ga.
Ata Mohammed Khan taught her Gumkali for three months. He then taught her another raga, the pentatonic Deshkar. He first taught her asthayi (first phase of the composition) and then antara (second phase of the composition). He also taught her to improvise in many ways from dhaivat to shadj, that is, from the sixth note to the first. Bibbi was encouraged to use her imagination to improvise. Ata Mohammed Khan gave her a thorough grounding in the basics and prepared her for bigger things. He also taught her a thumri in raga, Maand, “Kanhaa Na Jaane kar Preet/ Dekho Re Man Radhey”. 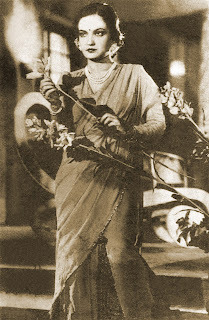 Her efforts to render a khayal convincingly – from alap (the introduction to the raga’s contour and mood), badhat (slow improvisation), behalwa (the creation of a wave-like motion through the juxtaposition of key phrases), fast tans and bol tans, and then seamlessly moving into dhrut khayal (or into quick tempo) were amply rewarded. Ata Mohammed Khan would tell his star pupil: “Taseer Paida Karo” (make your music soulful). She did that later while rendering light classical forms, and her renderings were full of bhava and wisdom as she grew older and became less dependent on virtuosity. By the time she reached her third teacher, Behre Wahid Khan Saheb, the venerable master of Kirana Gharana, Akhtari was a young woman of immense talent and musical maturity. He gave her a nuanced grounding in Khayal singing. But she knew that her real vocation lay as a light classical singer. 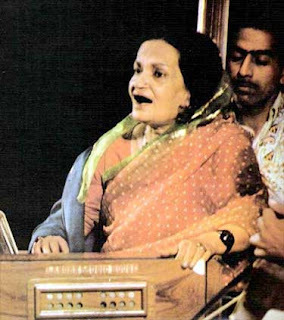 Twice in her life Begum Akhtar was faced with the abiding truth that music was to touch the hearts of people: first as a child when she heard a berni (low-brow singer) render a haunting dadra – “Purab Desh Bangal Se/ Wapas Na Aaye Morey Saajan ”; and then, while learning from Ata Mohammed, she heard in the wee hours of the morning a fakiran (a wandering woman minstrel) singing “Kaliyar Waley Morey Sai/ Laaj Rakh Leejo/Aaj Laaj Rakh Leejo”. The song entered Akhtari’s soul and she realised that virtuosity was not everything. 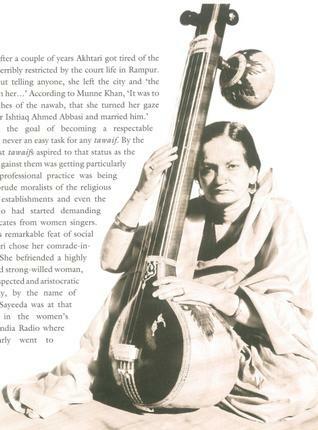 Begum Akhtar’s music was as colourful as her life. Though she sang thumri very well, in this genre she was surpassed by both Rasoolan Bai and Siddeshwari Bai. Her forte was dadra and ghazal. In these two forms, she was peerless. In the later part of her life, after her marriage to Ishtiaq Ahmed Abbasi, the quality of the ghazals she sang improved dramatically. He introduced her to poets such as Ghalib, Meer, Momin, Jigar Moradabadi and Faiz. She brought grandeur to Mirza Asadullah Khan Ghalib’s poetry; she was able to bring out with warmth and finesse the intellectual and spiritual tussle within him about man’s place in the universe, as she did with the anguished existential poetry of Meer Taqi ‘Meer’ and the defiant, celebratory nature of Fiaz Ahmed Faiz’s work, or the all-encompassing love of life in Jigar’s ghazals. How she managed all this was a mystery. She had little formal education but a highly developed aesthetic sense which would be the envy of the most sophisticated, well-read members of the privileged class. She also brought to the fore poets like Shakeel Badayumi, who wrote about everyday emotions and amorous experiences with style, and promoted younger, more populist poets like Sudarshan Faqir and Shamim Jaipuri. She had the ability to dignify and elevate relatively lesser-known poetry and bring out the nuances of seemingly ordinary verse that the lay reader was most likely to miss. Her great strength was her adaptability. In her early 78 rpm records when just out of her teens she sang in a very tuneful, high-pitched voice, her technique was solid though her aesthetics was quaint. It was as if she was singing in the style of an earlier era. She wore her heart on her sleeve unabashedly, and, no doubt, her listeners expected it of her. 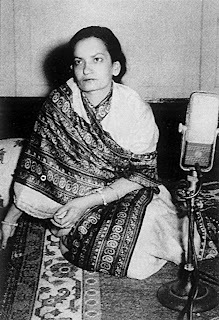 As she grew older, in her Begum Akhtar phase, her voice deepened, grew mellow, and she realised that life was indeed a vale of tears. Her singing became richer and reflective and gave even greater delight to the cognoscenti as well as her untutored fans. Her rendering of “Koeliya Mat Kar Pukar…” in late middle age is substantially different from, even more satisfying than, her earlier recording, which was full of youthful sparkle. Nawab Ishtiaq Ahmed Abbasi, Bar-at-Law, never really took his law practice seriously and it went down further when parvenu pleaders learnt to navigate the murky waters of the law and its enforcement. 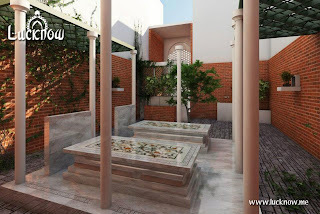 In addition he lost a substantial part of his property, first due to Partition and then through indifferent management. Abbasi Saheb had forbidden his wife to sing professionally after their marriage. After all, Akhtari had now become the wife of an aristocrat. Begum Akhtar became a victim of acute depression. The day was saved thanks to Sunil Kumar Bose, Chief Producer, Music, All India Radio Lucknow, and his indefatigable younger colleague, Luv Kumar Malhotra, who convinced Abbasi Saheb to allow his wife to sing for AIR. Then, within a decade, a downward turn in his fortunes forced him to let Begum Akhtar sing professionally. She was an instant success on the concert stage and as a recording artist for HMV, possibly the highest seller of discs in her category. Begum Akhtar’s career was more successful in social and financial terms than her senior contemporaries such as Badi Moti Bai and Rasoolan Bai, both of whom had to struggle to keep the wolf from the door, and Siddeshwari, who travelled to Delhi to take up an AIR producership to prop up a waning concert career. She loved the good life and constantly spent whatever she earned. She had a large brood of dependants, including Shammo and her 10 other children from various ill-judged marriages. A satlarha, or a seven-string pearl necklace, of great value would be left with jeweller-sitarist Arvind Parekh in the “off season” when he would advance her the money to tide over the lean period. Then when the music season began again, Begum Akhtar would pay him back and the necklace, a gift from the Nawab of Rampur, would return to her. This went on for a good seven or eight years until her death. When she passed away, the necklace was with Arvind Parekh. The gentlemen and artist that he was, he returned it to Abbasi Saheb but refused to accept money for it, saying that it was his privilege to have been of some assistance to Begum Akhtar. 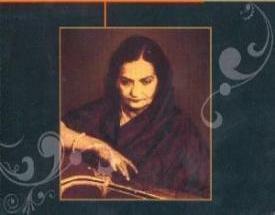 Begum Akhtar was a refined Ghazal singer and was called as Mallika-e-Ghazal or the Queen of Ghazals. Her style of singing is inimitable and few can match upto her style. Most compositions were self composed and based on Ragas. (1954 - hame.n dil me.n basaa bhi lo).